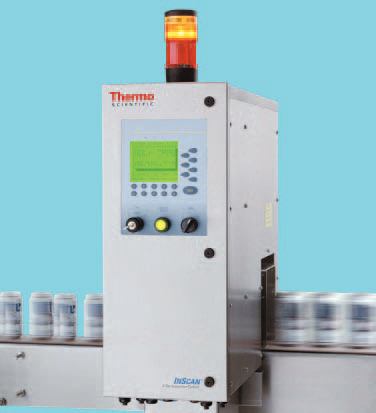 The Thermo Scientific InScan X-ray inspection system is a safe, easy-to-use inspection solution for beverage filling lines. Thermo Scientific X-ray inspection systems support the highest level of quality assurance, featuring state-of-the-art X-ray design and image analysis software that optimize sensitivity and probability of detection. Thermo Scientific InScan 100 X-Ray Inspection System includes a detection system that captures data both horizontally and vertically, then makes multiple, intelligent and accurate decsions to automatically identify and reject unacceptable containers. The InScan uses non-ionizing, low power, safe, X-ray technology to capture detailed images of the containers.